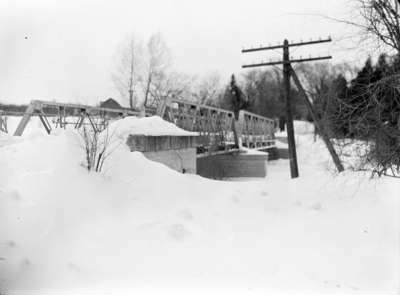 Black and white photograph of Brock Road Bridge in Pickering, Ontario during winter. The bridge is covered in snow. This photo was taken before the bridge was widened. Brock Road Bridge, 1947, Marjorie Ruddy. Whitby Archives A2013_040_1268.